This holiday, a killing contest takes aim at two of the most persecuted predators in North America: wolves and coyotes. The contest, scheduled in the Salmon-Challis area and hosted by the anti-predator organization Idaho For Wildlife, is billed as fun and wholesome entertainment for the entire family. Children as young as 10 can participate in the kill-fest and entrants who bag the largest wolf and the most female coyotes will win trophies and cash prizes. The "1st Annual 2 Day Coyote & Wolf Derby," is scheduled to begin December 28 -- ironically on the 40th anniversary of the passage of the Endangered Species Act (ESA), our nation's safety net for wildlife, that brought wolves back from the brink of extinction. On this very day, teams of hunters will enter public lands to kill as many wolves and coyotes as they can. They will use bait, calling devices and high-tech rifles. Is this fair chase? Or is it wanton blood-sport? Idaho is not alone in this carnage. More than 15 other predator-killing contests are scheduled throughout the country in January and February 2014. Species targeted include coyotes, foxes and bobcats. Many of these species are classified as "non-game" by state wildlife agencies; this means they can be killed 24-7 by almost any method imaginable. Moreover, the populations of the targeted species and the scheduled mass killings are often not even monitored by the state wildlife agencies. Regarding the Idaho "Coyote and Wolf Derby," Blaine County, Idaho, Commissioner Larry Shoen said, "Shooting contests conducted in the name of killing animals for fun, money and prizes is just not consistent with the values of most people in the modern world," as reported in the Jackson Hole News & Guide. "I have hunted all of my adult life. Hunting is not a contest and it should never be a competitive activity about who can kill the most or the biggest animals. The supporters of these sorts of activities would no doubt claim to be great defenders of hunting, yet they go out of their way to publicly present the worst possible image of hunting. If we hunters don't clean up our own act, someone else will do it for us and we won't like the results, but when that time comes, and it surely will, these 'hunters' will have only themselves to blame." Let's start with wolves. Economically, a killing contest strips money away from Idaho. A wolf tag can be purchased for as little as $11.75, permitting each hunter to shoot four to 10 wolves, depending on region. Wolf watching generates approximately $30 million annually to the towns around Yellowstone. This does not include the ecological benefits that accrue as wolves help restore balance and biodiversity to the to the ecosystem -- services unaccounted for by state and federal wildlife agencies. What is the value of a wolf alive -- over the course of his or her lifetime -- compared to one shot dead for a $11.75 wolf-hunting license? The ethics of recreational killing of wolves aside, the economics does not justify this insanity. 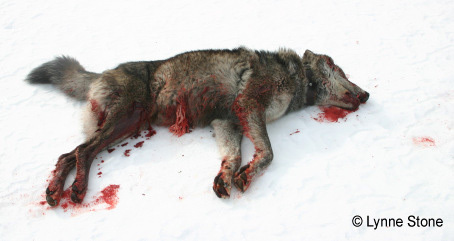 Coyotes are the other target species included in this killing contest. Too often, the justification used for mass killing of coyotes is that their populations need to be reduced and controlled to help ranchers and game hunters. However, science has shown indiscriminate coyote killing is not effective at reducing their populations; they quickly rebound and fill any vacancies. Coyotes, like other predators, self-regulate their population based on the biological carrying capacity of an area. Unexploited, coyote family groups establish territories which they defend from transient coyotes seeking new territories and mates, and will thus keep the local population stable. Lethal coyote removal, including killing contests, disrupts this stable social structure, allowing for vacant territories to be filled by outside coyotes. The importance of wolves, coyotes and other predators in maintaining stability and productivity in ecosystems has been well-documented in peer-reviewed scientific literature. Coyotes provide many ecosystem services that benefit people including their control of smaller predators, disease-carrying rodents and jackrabbits, which compete with domestic livestock for available forage. As apex predators, wolves increase biodiversity and ecological integrity. Even the contest sponsors are unwilling to defend their contest. When contacted by Reuters, "organizer and Idaho big-game outfitter Shane McAfee said media inquiries were not welcome." Reuters reports that the sponsor, Idaho for Wildlife, according to the group's website is "a nonprofit whose aim is 'to fight against all legal and legislative attempts by the animal rights and anti-gun organizations' to impose restrictions on hunting or guns." An examination into the charitable status of Idaho for Wildlife, Inc. found no listing of the organization as a tax-exempt entity with the IRS. What are we teaching our children by allowing killing sprees like this -- and inviting children to participate? Wildlife killing contests desensitize children, sending dangerous messages that killing for fun is acceptable, that an entire species is disposable, and that life is cheap. And what about the public safety hazards for the many families and their dogs who will be out in the Salmon-Challis region during the two-day predator blitz? Earlier this month USA Today reported that a pet malamute was shot dead by a wolf hunter in Lolo National Forest's Lee Creek campground in Montana. According to the report: "Spence said he looked up just as Little Dave's hind leg was struck by a bullet... Spence said a man, dressed mostly in camouflage, was standing on the road approximately 30 yards ahead of him and was aiming a semiautomatic assault rifle in his direction." It is time we decide as a nation that gratuitously slaughtering wildlife as part of killing contests or "derbies" is not acceptable in the 21st century. "A society that condones unlimited killing of any species for fun and prizes is morally bankrupt," stated Dave Parsons, a Project Coyote Science Advisory Board Member who led the U.S. Fish and Wildlife Service's effort to reintroduce the endangered Mexican gray wolf to portions of its former range in Arizona and New Mexico. Please help Project Coyote and allies stop this barbarity. Take action here and here. Project Coyote is a national non-profit organization based in Larkspur, California that promotes compassionate conservation and coexistence between people and wildlife. More info. here.